Chairman and CEO of Irving's ExxonMobil said to represent "middle ground" between Mitt Romney and Rudy Giuliani. ExxonMobil Chairman and CEO Rex Tillerson (right), no doubt deflecting another of Glenn Hunter’s annoying requests for an interview. UPDATE: On Tuesday, President-elect Donald Trump announced the selection of ExxonMobil’s Rex Tillerson to be his secretary of state. 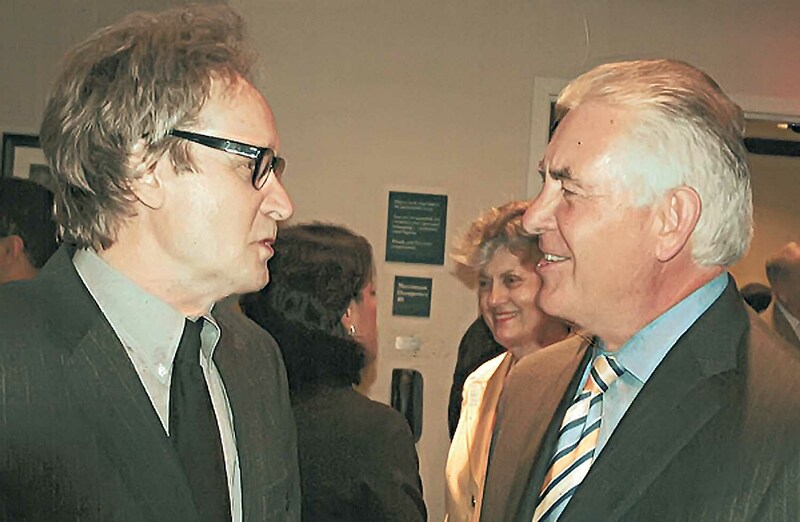 If Rex Tillerson is half as diplomatic with the Iranians as he’s been for years with me, good-naturedly turning aside request after request for an exclusive interview in D CEO magazine, he’ll make a great secretary of state. Word is the ExxonMobil chairman and chief executive is the odds-on favorite for that job in the Trump administration, potentially edging out—emphasis on the potentially—such heavyweight rivals as Mitt Romney and Rudy Giuliani. For years I’d see Tillerson, usually surrounded by an entourage including bodyguards, at an annual banquet put on by the World Affairs Council of Dallas/Fort Worth. Each year at the pre-dinner reception I’d maneuver in for the same ask: Would he consider sitting down for a Q&A interview with our publication? Each year Tillerson would grin affably and say, “Get in touch with our media relations people, and we’ll consider it.” Each year I would do just that and each year that’s where my email would seem to languish, never to be spoken about again. That said, the leader of the world’s biggest publicly traded oil and gas company is impossible not to like in person. I explain that’s so because he’s a down-to-earth, plainspoken, pickup-truck-driving guy from the Texas Panhandle/Plains (specifically, from Wichita Falls) who came up from less-than-grandiose circumstances before rising through the ranks in the business world. In a written questionnaire he submitted for the 2017 edition of our Dallas 500 special publication, Tillerson talked some about that. Tillerson went on to graduate from The University of Texas at Austin with a B.S. degree in civil engineering, then joined Exxon as a production engineer in 1975. Because of his age—he’ll turn 65 in March—he’ll be forced to retire from the Irving-based energy giant at that time. One Dallas businessperson who has watched him operate says Tillerson is an “interesting candidate” for the state department job. He is “really the middle ground between the best of Romney (smart, sophisticated, and ‘looks the part’) and Giuliani (tough and focused),” this observer says. “But, does he want to have the Senate libs beat him up under oath? Maybe?” If not I guess Tillerson can always retire to his farm, where he and his wife, Renda, raise cutting horses.